My last post about liquid greenstuff found me saying it has limited uses. I stand by my thoughts and managed to use it successfully the other day for one of those very specific uses. 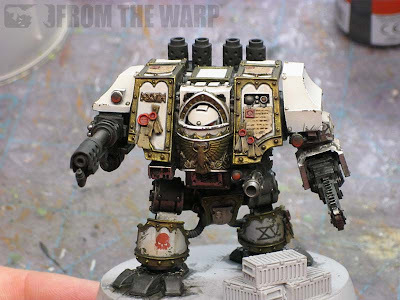 In the process of prepping the FW Deathwing Dreadnought I'm working on, I found a few more surface imperfections after priming it. 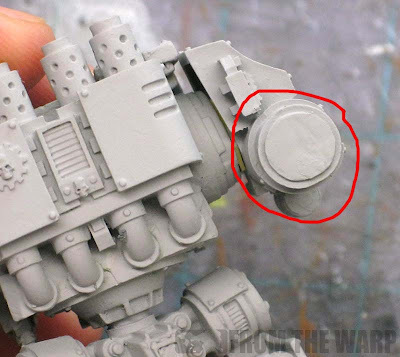 The big one was the back side of the inferno cannon canister. While it's on the back of the model, it's being painted to high standard and it would be terribly unprofessional of me to leave the surface pitted. I hadn't noticed it until I got some primer on it. I guess the light had been just right or I'd overlooked it in each of my passes looking for problems. Regardless, it had to be fixed before moving on. In my previous post, I'd said I believe that this stuff is only good for minor surface imperfections. Well, since that's what I had here, I decided to try it before I broke out the old school greenstuff. I went heavy in my applications. It ended up taking two passes to fill in all the surface problems. I applied the first pass, let it cure completely, gently filed away the excess and then repeated the whole process. 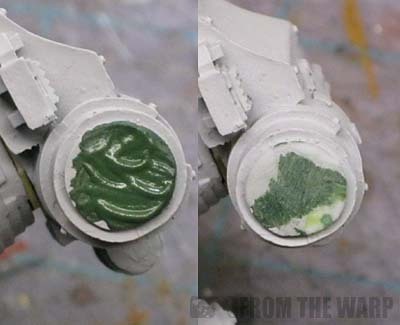 It took a little longer than it would have if I'd gone in with the old school greenstuff, but it did work well and I managed to work on other stuff while waiting for my liquid GS to cure between applications. In the end, it worked perfectly. A gentle filing of the surface once it cured left the liquid GS undisturbed in the recessed areas and I didn't have to worry about "wiping it away" with anything damp. Like I said, this stuff is good, but it's limited. In the right cases, it can make fixing a problem fairly painless. Even if it takes a few minutes longer in the end. And for a sneak peak, here's where the model stands right now. Pics of the finished model will go up Monday. Have you played about with the fact that the LiquidGreen can be manipulatd with water? I mean a touch of water will help it run into those small gaps, but I've used the stuff thick out of the pot too - carefully applied you can achieve raised trim or thin cables. I've found that it need to be built up over successive applications to get a convincing effect but you can achieve very fine raised lines. (Of course, you may be more proficient with regular GS anyway). This confirms my earlier comment on liquid putties by Gunze. Games Workshop hasn't invented anything new here, even though lack of distinct chemical stench must be nice. Ron, I actually JUST posted a review on use of LGS on my blog last night! Oink is exactly right, just a touch of water and it becomes much more useful. Very wrong on this one Ron. Like everyone said the key is to water it down to a paintlike consistancy. It covers more than minor imperfections too. When I did the welds on my tanks there was glue residue and marring next to the welds,where the rod I was using it more than the weld. 2-3 passes of thin LGS and it looks almost brand new. I'm sorry to chime-in, Ron, but... the peanut gallery is right: Liquid GS is the bees-knees! Water it down to get into the low areas, and just use a watery sponge to clean-up if it goes where you don't want it to. It dries super fast, so just build-up in layers. I don't understand how this project took you LONGER than it would have with the 2-part epoxy? You shouldn't have to file it like that at all, you're thinking too much like GS. oink: Maybe because I'm used to using the regular stuff, I don't use this stuff for anything other than minor surface imperfections. If I have to keep building it up, I'll use the regular stuff and save myself the dozen plus layers. Marcin Ciszewicz: It doesn't smell, so that's a nice feature for me with my studio upstairs. Fayte: I've used a damp Q-Tip to "remove" excess before. Trouble is, you can remove too much if you're not careful. Will Wright: Devlan Mud is not the miracle everyone thinks it is. Don't get me wrong, it's good... but once you learn to use the other colors, Devlan Mud really is limited. Dare I say a hindrance to some painters because they'll rely on it so much and not try using other colors. Mr. Esty: No apology needed. I think liquid greenstuff is something that has limited use for me in the end. @Ron Of late I have actually found that blending the different washes together gets better results, although I have been getting into glazing and wet blending a lot too. A bit of experimentation is good. However, like you say, I don't rely exclusively on Devlan Mud and it can become a trap. I tend to make washes now as I need them from whatever paint colour I think will work well (just add water and a tiny bit of washing liquid to break the surface tension and stop it pooling). Da_Sub: Welcome to life after Devlan Mud. Once you get past it (Mud) and learn/force yourself to try and use other things... a whole new world opens up. Ron, another "you're wrong" comment, but this time from the other direction: you're ascribing more usefulness to this drek than there actually is. If you want an odourless liquid putty you head straight over to the Vallejo plastic putty. And it sands fairly well, unlike any form of GS. Faolan (Jake): This is new for me Most of the time I'm accused of being wrong and not seeing the benefit of something. This is the first time I've been told I'm giving it too much credit. It has it's place for me. Limited as it may be in the way I like to work... I find it is useful in a very few applications and can't completely discount it's use. I suspect you're right though in the sense that they are probably other products out there doing it better. Ron: I remember the days Of Chestnut Ink madness, it was much the same thing. I think I used that stuff about 4 times, and all but 1 of those times were for commissions lol. I don't think I have ever really relied too much on one thing, even if it was "the way it is done". Having migrated to GW stuff post childhood Military Models it was always about freedom of expression for me, even if I could never nail Blanchitsu Style lol. Da_Sub: Chestnut Ink... wow. There's something I haven't heard in ages. Just curious, is the FW chainfist bit ambidextrous (as in, will it look out of place if converted to fit a right arm)? 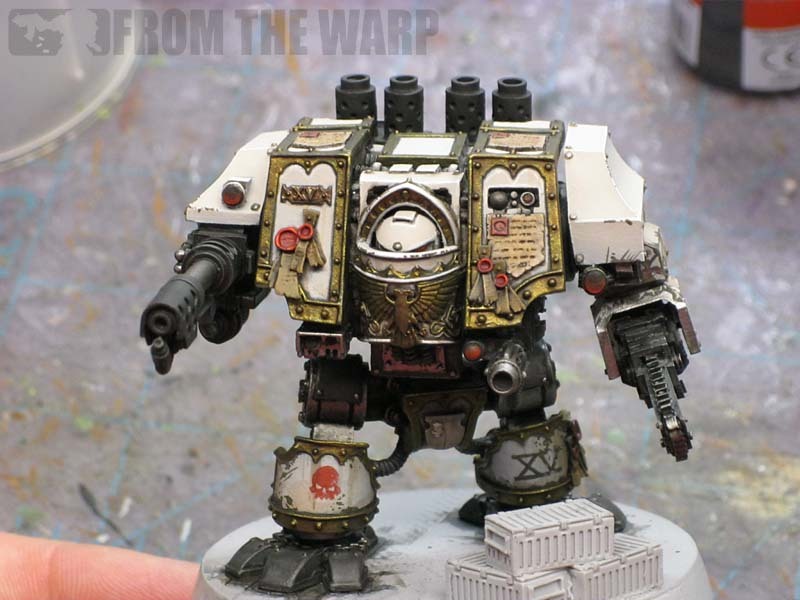 I'm really thinking of doing dual chainfists as a Blood Talons counts-as, but I was really wondering if the chainfist part was symmetrical (fuel tank and wiring, etc.). Thanks! exd: Yes, the chainfist itself is fairly symmetrical and would good on either side. The problem you might have is finding/making an attachment point so that you could mount one on the other side (right hand side). Other than that, you shouldn't have any trouble pulling it off. Awesome, thanks. You can just reverse the bit where it connects to the shoulder plating, right? I'm thinking of ordering two chainfists and one right close combat arm, and then just replacing the entire CC arm below the shoulder with the chainfist. exd: Yes. If memory serves me correct you should be able to use everything except the actual shoulder piece that connects to the torso. You'd need an actual right shoulder piece and everything under that should transfer over.